Have you ever considered how your procurement spend is impacting underserved communities? Do you need to go beyond tracking traditional diversity spend metrics to drive increased shareholder value? 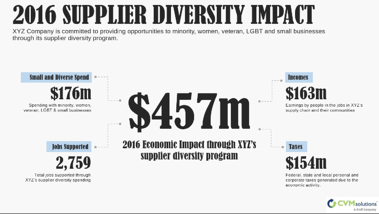 Let us show you how Economic Impact Modeling is the future of Supplier Diversity Programs. Let a Supplier Diversity expert discuss the power of Economic Impact and how to leverage it to bring your program to the next level.